Heat your home and generate electricity at the same time with a micro-CHP unit. Micro-CHP or micro combined heat and power is a technology which generates heat and electricity simultaneously, from the same energy source. Domestic micro-CHP systems are currently powered by mains gas or LPG; in the future there may be models powered by oil or bio-liquids. Although gas and LPG are fossil fuels rather than renewable energy sources, the technology is still considered to be a ‘low carbon technology’ because it can be more efficient than just burning a fossil fuel for heat and getting electricity from the national grid. The main output of a micro-CHP system is heat, with some electricity generation, at a typical ratio of about 6:1 for domestic appliances. A typical domestic system will generate up to 1kW of electricity once warmed up: the amount of electricity generated over a year depends on how long the system is able to run. Any electricity you generate and don’t use can be sold back to the grid. The only difference to a standard boiler is that they are able to generate electricity while they are heating water. This technology is new to the market, although the principal of the Stirling engine is well established. The electrical output is small relative to the heat output (about 6:1) but this is not necessarily a problem for micro-CHP. This is the most proven technology. These are essentially, and sometimes literally, truck diesel engines modified to run on natural gas or heating oil, connected directly to an electrical generator. Heat is then taken from the engine’s cooling water and exhaust manifold. The engines can have a higher electrical efficiency than a Stirling engine but are larger and are not currently available for the normal domestic market. This is also new to the market in the UK and globally. Fuel cells work by taking energy from fuel at a chemical level rather than burning it. The technology is still at developmental stage and not widely available to consumers. Electricity generation as a by-product of heat. When the micro-CHP is generating heat, the unit will also generate electricity to be used in your home (or exported). Carbon savings. By generating electricity on-site you could be saving carbon dioxide compared with using grid electricity and a standard heating boiler. Financial income. Micro-CHP is eligible for Feed-in Tariffs and you will earn a tariff for each kWh of electricity generated by your system. You will also receive another tariff for each kWh of electricity you export. Installation is easy. 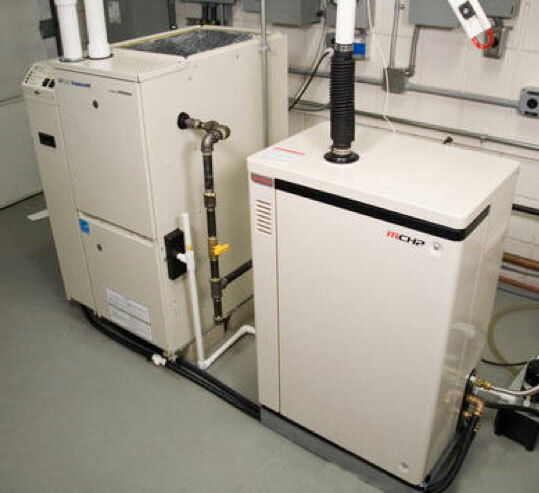 For the householder, there is very little difference between a micro-CHP installation and a standard boiler. If you already have a conventional boiler then a micro-CHP unit should be able to replace it as it’s roughly the same size. However, the installer must be approved under the Microgeneration Certification Scheme. Servicing costs and maintenance are estimated to be similar to a standard boiler – although a specialist will be required.